What The Trees Know - an improvised, immersive performance through music and poetry, that explores human vulnerability, in which the audience and the artists are blindfolded - performed by South African poet Toni Stuart and UK poet Remi Graves. A powerful programme of talks, debates and workshops forms the foundation of the weekend, exploring issues such as activism, social change, the future of African politics in a new age of populism, and gender equality. Participatory workshops include a Short Story Surgery, to empower the next generation of writers to create potentially prize-winning texts, and the much-loved Twerkshop, celebrating West African dance. 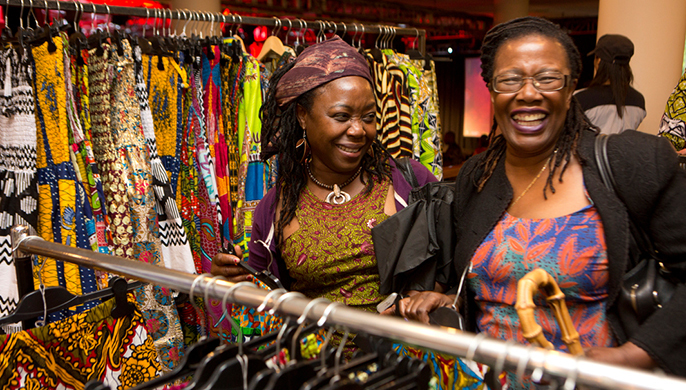 Africa Utopia also hosts wide-ranging free events across Southbank Centre’s site, from a Black History Walk along the Thames which explores British Civil Rights, African and Caribbean history and black heroes along the riverside, to Afrikan Yoga on Southbank Centre’s Queen Elizabeth Hall Roof Garden. The Big Sing event is an opportunity to all join in and sing, while The Africa Utopia Block Party with DJ Rita Ray, brings you everything from afrobeat to Congolese jazz, to South African electronica. Running throughout the weekend, the Africa Utopia Marketplace creates a bustling arena in the Royal Festival Hall offering the latest in African and African-inspired arts, crafts and workshops and the space under Hungerford Bridge is transformed into a bustling African inspired street food market with 14 stalls of authentic African cuisine and live music. Previous performers, artists and speakers who have taken part in Africa Utopia include award-winning Senegalese musician and human rights activist Baaba Maal and Grammy Award-winner Angelique Kidjo, the former First Lady of Somaliland and founder of Somaliland’s first maternity hospital. Other star acts have included Edna Adan; Kenyan creative collective The Nest; South African performer Spoek Mathambo; 'godfather of Ethiopian jazz' Mulatu Astatke; the Kinshasa Symphony orchestra; and many more from across the African continent and the diaspora. The Africa Utopia Block Party returns to Southbank Centre’s festival terrace. With everything from Afrobeat and Congolese jazz, to South African electronica, DJ and global authority on afrobeat Rita Ray brings the very best pan-African tunes right to the riverside. Everything from Afrofunk to hip-hop and kora can be heard at the Sounds Under the Bridge pop-up stage, whilst enjoying some delights from the Africa Utopia food market. This eclectic mix of music has been programmed by brilliant rising-star, singer songwriter, Sherika Sherard. Join storyteller Lanre Njoku in this joyful collective singing, song-writing and storytelling workshop which embraces freedom of expression through the use of the voice. What chance do African nations have of thriving in the new global and political landscape? What impact will Brexit and Trump have on trade, growth and foreign policy and how will the continent drive its own agenda? Leading activists, academics and experts investigate, as they predict what the future holds for the continent and its diaspora. This social media workshop led by Temi Otedola (78K Instagram followers), founder of fashion and lifestyle blog jtofashion.com (featured in Vogue, The Times, TRUE Africa and CNN), provides tips on standing out from the crowd, nurturing a brand, and appealing to a global audience. Our Mighty Groove workshop and social dance provides an immersive experience of the New York underground club scene. Led by Vicki Igbokwe, Choreographer and Founder of Uchenna Dance, the workshop and social dance is inspired by Uchenna Dance's full scale production Our Mighty Groove. Stretching from the Arabian sea to the cities of Khartoum, Nairobi, Hargesya and beyond, the 'Greater Horn of Africa' is a meeting place of cultures that has produced some of the most exciting literary talents of recent times. Visitors discover the diverse styles, current trends and concerns which contribute to making this distinctive region a literary powerhouse. From a pan-African all girls science academy in Ghana, to hackathons and digital clubs, this session explores how technology is rapidly reshaping culture and society in Africa and beyond. The event also includes an interactive workshop providing the chance to create and pitch an Africa focused tech-driven business or social idea to entrepreneur Tom Illube, tech entrepreneur and Powerlist’s most influential person of African and African Caribbean heritage. 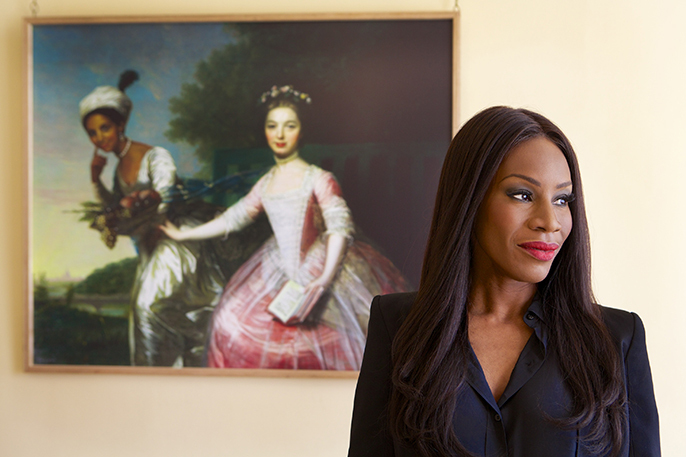 Black in the Day is an exciting collective focused on documenting black British life. This is a submission-based archive documenting lived experience by asking people to find and share photos. Visitors are invited to bring along photographs showing any aspect of black life to create and add to their own digital archive. If you sliced through your life, like a tree’s trunk, what story would the rings of your life tell? This improvised performance through music and poetry, by South African poet Toni Stuart and UK poet Remi Graves, in which the artists and the audience wear blindfolds, explores human vulnerability and the role it plays in the ability to build relationships and grow true community. Participants practice Afrikan Yogic movements known as Raagus (dance), Hika (affirmations), visualisations, Smai breathing, Hudu (similar to Afrikan Tai Chi) and Still Postures from the Nile Valley, Ancient Africa. 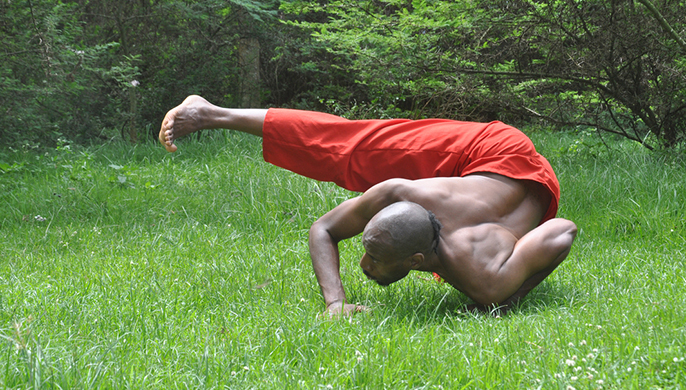 The session is delivered by founder of Afrikan Yoga, Pablo Imani and is open to all levels. Visitors are welcome to attend a live poetry reading at the newly designed Room for Children, in The National Poetry Library. One of poetry's star performers will bring the space to life with poems and songs for children and their adult carers to listen and sing along to. At a special immersive performance, visitors can experience what it feels like to sit in an orchestra. An initiative of the Chineke! Foundation, the Chineke! Junior Orchestra is a youth orchestra of black and minority-ethnic musicians, aged 11 to 18 years. Visitors are invited to join members of the Chineke! 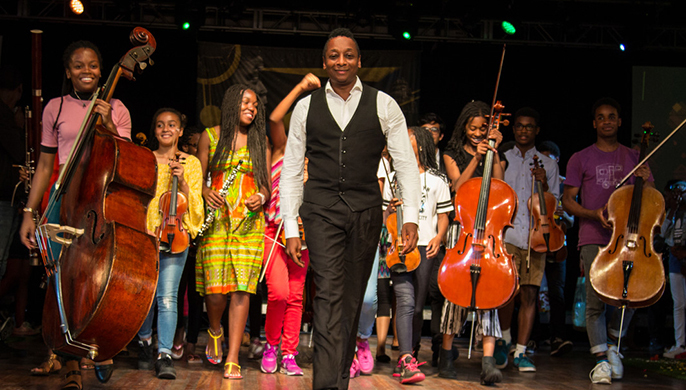 Junior Orchestra with this fun session that provides an opportunity for children to play different orchestral string instruments under expert guidance from these young talented Chineke! Junior members. An upbeat dance workshop with Future4Youth exploring the connection between Hip-Hop Dance and Dance of the African Diaspora. Future4Youth work with youth companies from across the UK through practical workshops, performance opportunities and mentoring. What does it mean to be an African man in the disapora? Global media brand Nataal presents a special event and photographic body of work by photographer Mehdi Lacoste and stylist KK Obi celebrating contemporary African masculinities. Featuring performances and talks by London-based creatives including Larry B, Akinola Davies, Emmanuel Balogun, Nataalfounder Alassane Sy and others. Afro Play explores identity in African culture through the theme of ‘Colour vs Place’. This exciting performance features dance artist’s exploration of their journey to discover their identity. The project is lead by One Dance UK Trailblazer Champion 2017, Ithalia Forel. How are activists on the African continent and in the diaspora working across borders to make real change happen? What lessons can we learn from each other and how do we turn local action into global solidarity? Visitors are invited to find out the answers to these questions and more in this talk. Participants are invited to get creative and play with African textiles and printing at this free session, which offers the chance to create a unique printed creation. Programmed by Southbank Centre’s Festival Makers, this hour of live music will be exclusively billed by the young team who have taken over the programming reigns after an intensive course working with the music and programming team for Africa Utopia. Kinetika Bloco and BeatLife collaborate to create an African inspired celebration performance fusing rhythms and genres from the African Diaspora. Sound and visuals collide in an Afro-futuristic multi-artform experience. Travelling from an unknown past to unseen futures, Cosmic Ashoke explores Afro-futuristic poetry and music through unique visual and auditory experiences. When race and queerness intersect; Violet Nights is a space for young people to safely experiment, socialise and explore with music, performance and discussion. The two-day pass gives access to talks, debates and workshops covering everything from art and activism, politics and gender equality, to fashion and tech, for the entire Africa Utopia weekend. How is Africa leading the way in thinking about activism, the arts, fashion and tech? The day pass includes talks from leading activists, artists and thinkers on how they are affecting social change across the continent and the diaspora.